The Westerwind volleyball team was hoping to turn its season around by playing host to the Westerwinds Classic this weekend, facing Sun Belt Conference member Western Kentucky University; Conference USA member Saint Louis University; and Midwestern Collegiate Conference members universities of Illinois at Chicago and Wisconsin at Green Bay.The ‘Winds opened up the tournament against WKU Friday and competed in a back-and-forth first game against the Hilltoppers, but fell short, 15-11. In the second game, WKU jumped out to a 5-1 lead and got the score up to 13-2 before winning 15-5. The Hilltoppers started the third game almost like the second, jumping out to an 8-1 lead before the ‘Winds came back within 10-7 before WKU scored the last five points to take the match. Freshman outside hitter Jennifer Brandt led the team with eight kills, junior middle blocker Jennifer Dockemeyer added seven kills and seniors outside hitter Kandace Kessel and setter Vicki King each had five kills. King also had a team–high 28 assists and a game-high 13 digs. In their second match of the day, the ‘Winds took on Wisconsin at Green Bay, which entered the game with a 0-5 record. The Phoenix, however, didn’t look like a 0-5 team in the first game, jumping out to a 9-0 lead and taking the game, 15-6. WIU started the second game by building up a 7-5 lead before UWGB scored 10 unanswered points to take the second game, 15-7. The ‘Winds were down early in the third game, 7-4, before scoring five unanswered points to take a 9-7 lead and did not relinquish the lead en route to a 15-11 win. The fourth game saw the ‘Winds down as much as 8-3 before climbing back to take a 15-12 victory, setting up a fifth game. The fifth game was an opposite of the fourth, as UWGB overcame a 4-1 deficit to take a 9-8 lead. The Phoenix would not relinquish the lead and took the win, 15-11. Dockemeyer and freshman outside hitter Sallie Bowles each had 10 kills in the match; Kessel had nine; Brandt had eight; King had six; and senior setter Rebecca Lawton had five. Lawton also led the team with 40 kills and, along with Kessel and Bowles, had 14 digs. “We didn’t play well. One thing we try to stress is passing and we didn’t pass well; it’s hard to run your offense and expect your hitters to do something and your setters to set the ball when you don’t pass,” WIU head coach Jolene Vinson said. “On defense, we’re one step behind and slow-moving to get into the defensive position. “We played terrible and we need to play better. If we want to stand to accomplish any of our goals, we’ve got to play better volleyball. The team knows it, I know it, and playing’s not the thing we need to do tomorrow, but we need to practice back in the gym three to four hours,” Vinson added. With that in mind, the ‘Winds set out to change their bad fortune in the tournament against SLU. The Billikens broke out to a 7-0 lead before WIU put four points on the board to close the gap. SLU held down the ‘Winds’ attack and took the first game, 15-5. 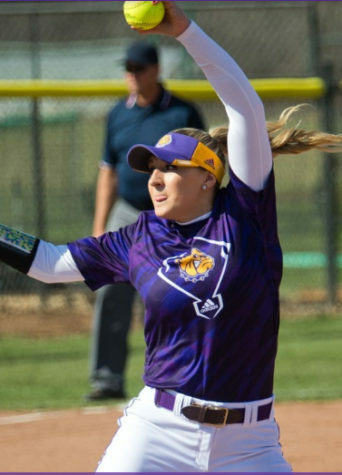 The second game saw the ‘Winds get close to the Billikens many times, with WIU tying SLU at 6 and getting within 11-12, but it couldn’t capitalize and was defeated, 15-12. The third game was more like the second as WIU got close again, tying SLU at 6, 9 and 10, before losing the game and match, 15-11. Even with the loss, Vinson was pleased with the improved play. Dockemeyer led the ‘Winds with 10 kills, Brandt collected eight and sophomore outside hitter Amy Lenz added five. King had 21 assists, while Brandt had a match-high 12 digs and Bowles and freshman outside hitter Jessica Sullivan each had 11 digs. In the last game of the tournament, the ‘Winds took on UIC, which was also winless in the tournament entering the match. WIU came back from a 6-2 deficit to take an 11-9 lead before the Flames came back to take the first game, 15-11. The ‘Winds jumped out to a 3-0 lead in the second game before UIC took a 4-3 lead. WIU got as close as 7-6 before the Flames scored six unanswered points, taking the win, 15-7. The third game went back and forth as the ‘Winds went up as much as 10-6 and 13-10 at one point before the Flames took the game and match with a 15-13 win. Bowles led the team with 11 kills and Brandt and Dockemeyer each had 10. King had 33 assists, with Brandt collecting 11 digs and Bowles and Sullivan each adding eight digs. Vinson was pleased with the performances of King, who was selected to the All-Tournament team, and Bowles. “Vicki brought a big spark to us in two games in the right side. Here’s a setter and we’re asking her to bring something to the court, and she brought something special to the court,” Vinson said. SLU ended up winning the tournament by sweeping the other teams and had two players, tournament MVP middle hitter Laura Risley and setter Amy Scheller, selected to the All-Tournament team. WKU took second by going 3-1 with middle hitter Kim Carpenter taking All-Tournament honors. UWGB was third with a 2-2 record with outside hitter Tara Acord selected to the team. UIC placed fourth with a 1-3 record and outside hitter Jackie Utz took All-Tournament honors. The ‘Winds dropped to 1-7 after the tournament and will go on to the Western Michigan Tournament this weekend. Vinson is optimistic for a turnaround. “We’ve got a lot of work to do – we have four days of practice to get ready and we need this time,” Vinson said. “We need to get back in the gym and get refocused on the little things like the serving, passing and the defense. Once we get those things down, this is going to be a great team and it will be fun to watch.